I’ve been waiting for Honeywell to release an industrial barcode scanner with their new Adaptus imager, and it’s finally available with their Granit line of scanners. The Granit 1910i barcode scanner is the cabled version of their new line, and it should be a smart fit for heavy manufacturing, cold storage, or any of those environments that would take down lesser scanners. The Adaptus 6.0 imaging technology (I think that’s the full marketing term for it) has been around for a couple years in their Xenon scanners, and it’s a tremendous step up from the previous imager technology. The older Adaptus revisions were fine, but sometimes it’s nice to move into awesome or amazing territory. Yes. I just said barcode imaging technology is awesome. With the Granit 1910i, Honeywell tuned the scanner for extended range scanning. So now those barcodes on the top shelf at Costco can be read as easily as the one right in front of you. For regular UPC barcodes, you get a scan range of half an inch to almost two feet, which is pretty solid for an imager. 20 mil gets to nearly 3 feet, and I can only imagine how far away you can be while still reading 100 mil reflective barcodes. Those things are like magic. Industrial areas require tougher equipment. You might accidentally hit things with a forklift, or drop them off scaffolding, or maybe use two scanners to pound out a killer drum solo, and you need them to work after this abuse. Thankfully the Granit 1910i is one tough scanner. The rubberized body reinforces the scanner well, protecting it from 50 6.5-foot drops to concrete, at -22 degrees F. I imagine that testing was someone realizing it was 22 below and dropping the scanner while searching for a coat. That does lead to the operating temperature specs. This scanner can scan barcodes at 22 degrees below zero Fahrenheit. For everyone outside of the US, that’s -30 degrees Celsius. I don’t know what’s stored at that temperature, but my guess is it’s for ice cream inventory management. The Granit’s reinforced body is sealed to IP65 standards. This means no dirt whatsoever can get into the scanner (that’s the six,) and you can tag it with low pressure jets of water without the water getting into the scanner either (that’s the five.) That kind of sealing is fantastic for keeping track of inventory during a water balloon fight. Or garden center inventory control. 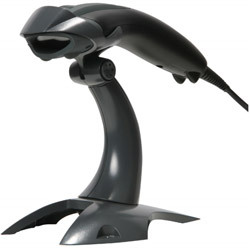 All in all, the Granit 1910i is a great way to scan barcodes, especially in environments where other scanners will fail. Honeywell has released a new Voyager, more voyagey than the old Voyager and way more voyagetastic than the original. The Voyager 1400g offers omnidirectional scanning and is a great fit if you’re looking to add 2D scanning to your business without breaking the bank. 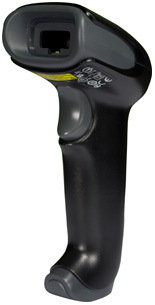 The barcode scanner comes in three flavors: a 1D only imager, 1D and PDF scanning, and full 2D imaging. What’s really great about these scanners is that if you know at some point down the road you want 2D imaging, but right now you can’t justify the full cost, you can get the 1D model, then upgrade the scanner itself later on. No need to buy a full scanner each time you want additional functionality. I’ve gotten to take a Voyager 1400g out for a spin, and it’s a great device. Standard UPC barcodes are read pretty easily from up to a foot away and at all angles, cutting out almost all of the hassles you run into with a standard 1D scanner. 2D barcodes are read equally easily, including Data Matrix, QR, and Aztec codes. The Voyager 1400g uses a red LED as an aimer, but a white light to illuminate the barcode, so if you have a way to power it, it can be a great makeshift flashlight. The Voyager 1400g, by nature of being an imager, can read barcodes on cell phone or LCD screens. This is great for retailers looking to do mobile couponing, ticket checking, or just trying to see if you can read weird barcodes on screens. The scanner is not able to do optical character recognition (OCR) or image capture, but there’s the Xenon 1900 ready and waiting to recognize characters and take pictures, so no biggie. We did run into some issues scanning outside on a sunny day. Our test sheet of barcodes is pretty glossy, and I think we managed to find the one angle where glare from the sun actually made it impossible to get a good read. As soon as a little shade covered the barcode, the Voyager 1400g would pick up the barcode. But really, it’s such a specific instance that it’s not too big a deal. All in all, the Voyager 1400g is a fantastic and affordable addition to any business. The fact that you can easily upgrade the firmware to transition from 1D scanning to 1D and 2D scanning makes it great, in my mind, for retailers who want to scan 2D barcodes eventually, but don’t want to have to buy multiple scanners, or can’t justify the cost for a full 2D scanner quite yet. Honeywell is continuing their transition away from legacy products, this time releasing the Voyager 1202g barcode scanner, a cordless laser scanner that should eventually replace the old VoyagerBT. The Voyager 1202g uses the same scan engine as the Voyager 1200g, so you get a cordless scanner that doesn’t sacrifice scanning to maintain battery life. On retail barcodes, you get an optimal scan range of contact to about a foot out, which should make it easy to read products without searching for a sweet spot. Like the Voyager 1200g, the Voyager 1202g can also read pretty mangled barcodes, as Honeywell showed in a video a while back. It can also read barcodes with a minimum contrast of 10%, so faded barcodes shouldn’t be a problem at all. The Bluetooth radio in the Voyager 1202g is pretty standard for the current generation of cordless scanners, giving you about 33 feet of radio range before interference can become a problem. Honeywell claims they’ve gotten 300 feet line-of-sight connectivity, which falls in line with the legacy VoyagerBT, but we won’t be able to test those claims until we get one in house. Swapping batteries in a retail cordless scanner is pretty rare, but sometimes it’s needed. Thankfully, Honeywell’s built the Voyager 1202g to give you tool-less access to the battery compartment, a tremendous lifesaver when compared to competitors’ use of screws to lock compartments. The battery is an 1800 mAh Lithium Ion, which seems like a lot of milli-Amp hours. 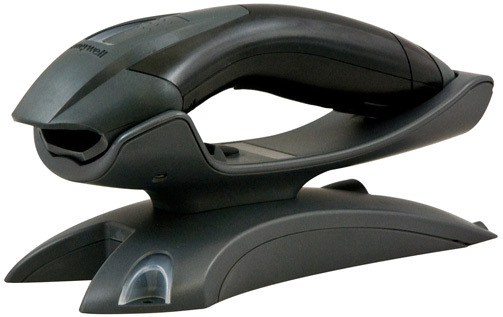 For this scanner, 1800 mAh translates to scanning 45,000 barcodes per charge, or 12 hours of work. That’s pretty solid, I don’t think I’d ever want to scan barcodes for that long, so I’d be set. And recharging takes about 4 hours, so you should be set for day to day scanning. Durability is pretty vital for cordless scanners, as they seem more likely to be dropped than their cabled brethren. The Voyager 1202g is built to withstand 30 drops of 5 feet to concrete, shoulder height for an average person. Waist height for Yao Ming but I don’t see him getting into retail any time soon. The scanner also sports an IP42 environmental seal, so dirt & random water splashes shouldn’t get in to harm internal components. I wouldn’t put this out in a lumber yard, but it should be okay in most retail environments. With the Voyager 1202g, you get a 3 year warranty standard. Honeywell offers Service Made Simple comprehensive coverage plans if you really want to protect your investment. In all, the Voyager 1202g is a great progression from the older VoyagerBT, and a fantastic upgrade for aging hardware.